The protagonists of changing the life style don't like to be excessively organized and to play the role of "guiney pigs". By the momentary survival (e.g. at the time of wrecking) every bit of saved energy and coordination among people is very useful. If we succeed in harmonizing our Green home in such a way we spare more time for doing things of our interest. Don't be afraid of rationalization. The variety of problems and their combination (in the running of the household) will surprise you and make you very busy. From above mentioned considerations we have developed our program for the Green home. At the beginning it was put together partly from a modified Decalogue of the Cousteau foundation. The crew had freedom in its realization. After some time, when we were feeling that the crew could take on more tasks, they started to write down records, provide measurements, ecological calculations etc and recapitulate collected information what is more or less useful for our program. 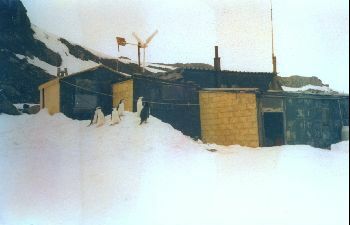 The findings from it should be turned into a brochure called " The green home in the rough Antarctica", as were the findings from the survival program. (The brochure "Man in extreme conditions" has already been published in 76 000 copies,in english,german,czech). Collecting the waste, register and liquidate them forms the contents of the global program, which takes part on Nelson Island as well. It is manual work, which involves walking along the seashore at periodical intervals (the best time is a low tide), recording the impacts (artifacts made by human hands) and collecting them. The most dangerous ones, like plastic stripes, bits of rope, nets etc., which endanger the sea animals, are taken to the collecting place straight away. Then they are taken away from the Antarctica to be destroyed. All dates are methodically compiled in the INACH organization which has been collected similar information on the neighboring Livingston Island for 30 years. The most interesting findings, like floating cards, which had been sent out on purpose, we send back to their place of origin. Very interesting findings, as old historical pieces covered with moss are left on the place for marine archeologists. The wood, usually from broken pallets and boxes, is being dried and used as fuel. Collections from five sections, each of them about 1-1,5 km long, are done every week through the whole year, on the accessible oases and islands once a month in summer, and in the faraway places once in a year. For "The Institute for Sea Mammal Research" in San Francisco we count the whales. We keep records of the time, number, direction they are floating and make their photos, if we can catch them on the sea surface. It seems that the number of whales or the spotting of whales is increasing every year.